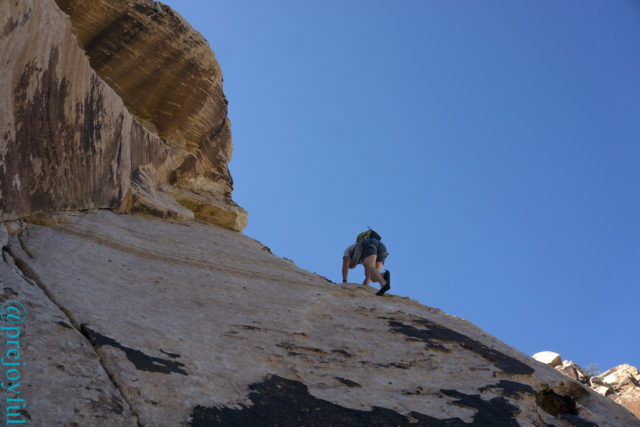 A goal of the trip, from the beginning for me has been to climb at some of the classic sandstone climbing-Mecca destinations in the desert southwest. We happened upon Indian Creek by surprise last fall, but were pushed out by weather. Similarly, we had been thwarted by weather when we went to Red Rock in Nevada in the late fall. I wanted to go back. Indian Creek. The six shooters here tempt us, though we were unable to climb them due to rain. 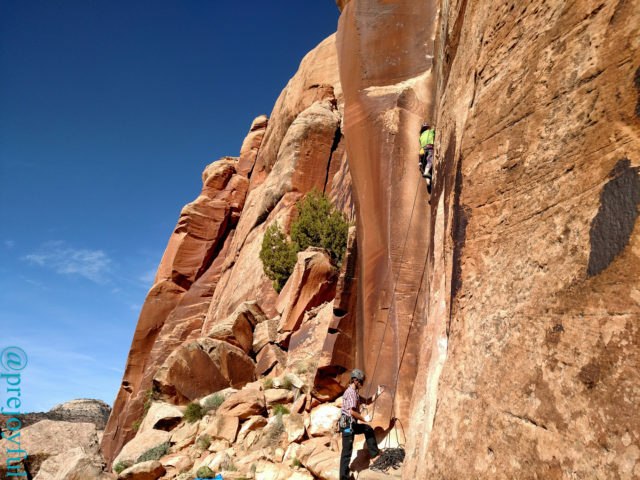 As it turned out, our mid-April Wilderness First Responder class in Moab was the perfect opportunity to meet other climbers and get some psyche to get out there and climb some sandstone! Annie looks up at Led By Sheep from the approach gully. 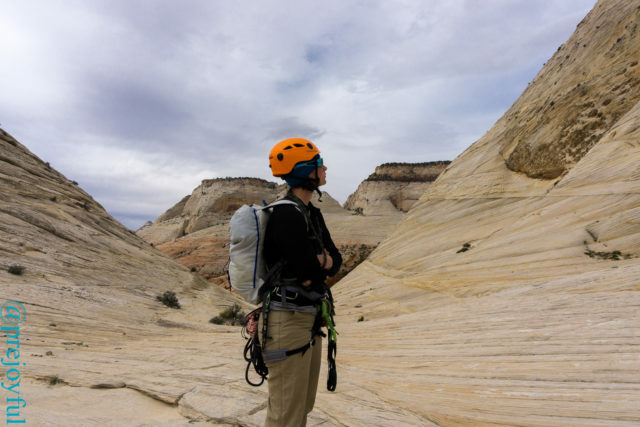 Before the WFR class, Annie and I went to Zion, backpacked across it, and generally enjoyed its splendor. 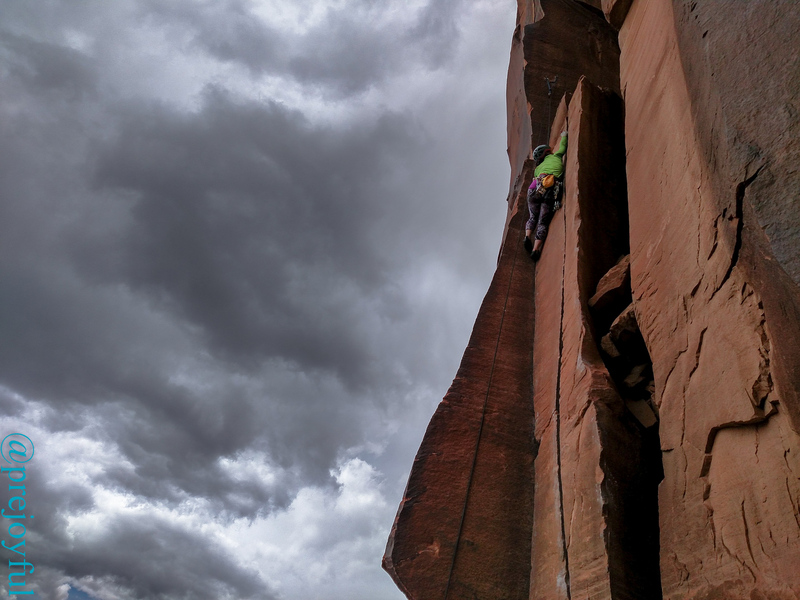 We started a (bolted) classic route up Aries Butte Led By Sheep (5.6 4p sport) in East Zion, but Annie was nervous, and then it started to rain, so we got to enjoy a 3rd/4th class descent on wet sandstone. Snow the next day ensured that we would not get to climb in Zion. The 10-day WFR class had a rest day, and I planned to go out climbing at Indian Creek with two others from the class while Annie hiked with other classmates. 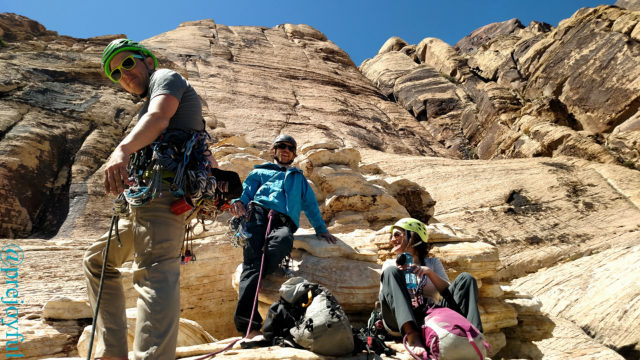 Josh (@theycallmethejish) and Sharon (@mewtotes) were good sports, had trad racks, and were also excited about getting in some splitter Wingate sandstone cracks. 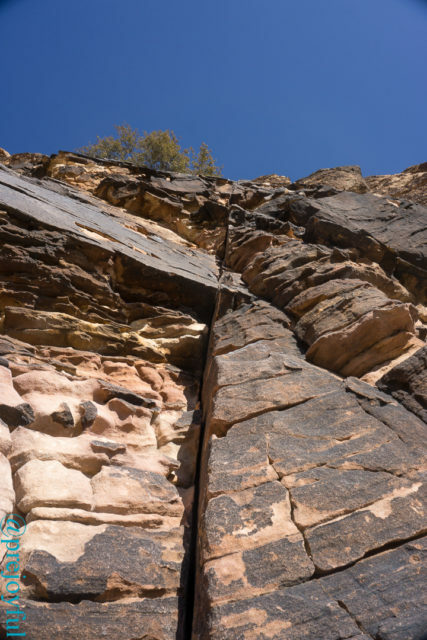 We ventured forth, and decided to check out some cracks near where I had been before at Donnelly Canyon, because it was easy to get to, and offered several “moderate” cracks that we could work on with the gear we had. We set off and found nobody at the crag early in the morning. 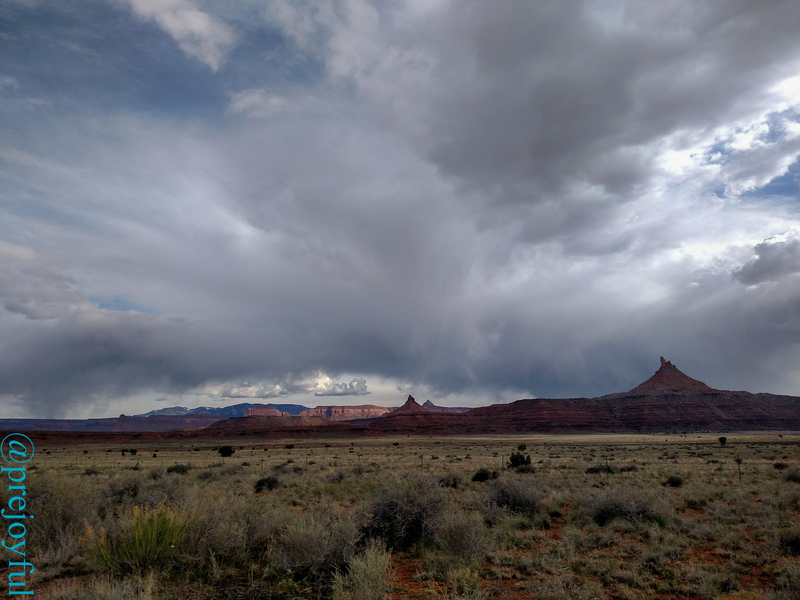 The weather had been dubious, but the rock looked dry, and there was no easily detectable sign of wetness, so we headed directly to Chocolate Corner (5.9+ 50 ft, trad), normally a very busy climb. It was empty, so we did the standard Roshambo to decide if Josh or I would lead first. 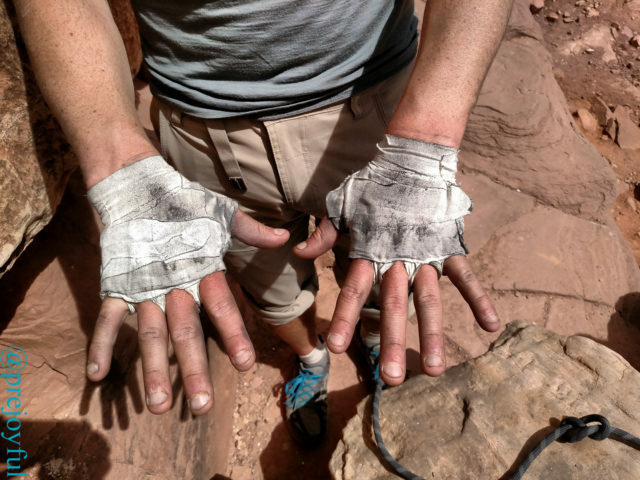 I lucked into the first lead, and after consulting gear, constructing tape gloves, looking over the climb, and doing safety checks, I set off. It was a fun and good lead, and the guidebook had an accurate gear list. As a bonus, I managed to place one of my large hexes in an perfect chock placement! I set up a toprope anchor, and lowered, cleaning my gear. Josh then led the climb, quickly and cleanly (he’s a much better climber than I am, and has his SPI certification to boot! ), and lowered to let Sharon clean the climb. Sharon cruised it, like a boss, and soon we were all on the ground, looking for the next climb. Crack climbing is dirty work. Nobody wanted to back down, so we decided to kick it up a notch with Railroad Tracks (5.10-, 75 ft, trad), which was just down-wall at the end of Battle of the Bulge Buttress. Josh got the first lead on this. We expected it to be a bit harder, but to go smoothly, since it was only a little bump in grade. No such luck. Barely off the ground, with two cams in, Josh needed a rest. The beginning of the climb starts with awkward thin hands, then widens, but steepens before getting to a “rest” below a partial roof. Pulling out around the roof, you gain twin cracks (railroad tracks) with one at a horrible thin hands width and the other at rattly fingers. The right crack gradually widens to hands, then fists, but is at a terrible angle. The left crack eventually widens to thin hands, but that’s awful also. Stemming somehow doesn’t work as well as you might hope. Josh did battle, but hung on cams after nearly every move. He cleaned while lowering, I studied the route some more, made a minor gear adjustment (more small cams), and started off. I barely fared better, getting 3 cams in and 15 ft off the deck before needing to rest back on a cam. The small grade bump to 5.10- really hurt! The awkward crack widths were helped slightly by the dual cracks, but not much. Sporty-feeling moves on bad feet seemed to be the way to go, but I continued to plug along with pure-crack climbing maneuvers, just because they felt more secure. I also hung after nearly every move. I can’t say this is a good introduction to 5.10 climbing at the Creek. It was a real struggle. I think I only uttered four-letter words for the whole lead. Of course, when Sharon went to climb, she cleaned and made the whole thing look easy. I tried once more on top-rope, thinking maybe it would be easier that way, but no – it still hurt, and still was wicked hard. Sharon looking like a pro on Railroad Tracks. Josh leads Naked and Dead. 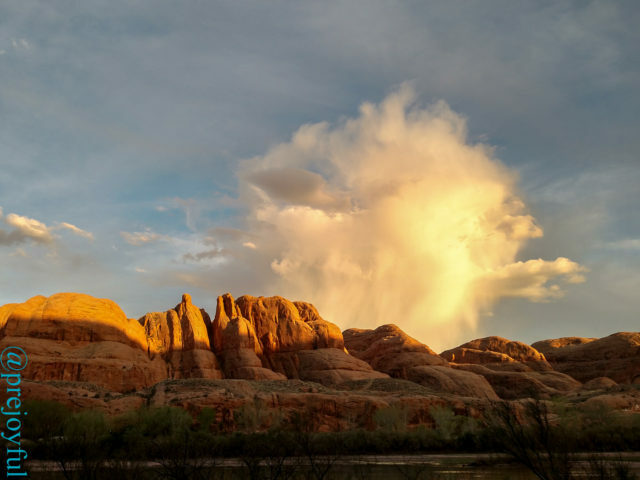 Beaten, bleeding, and bruised, we retreated happily after our day of battle with the sandstone, enjoying beers, salsa and chips along with a lightning tour of Indian Creek and Newspaper Rock. 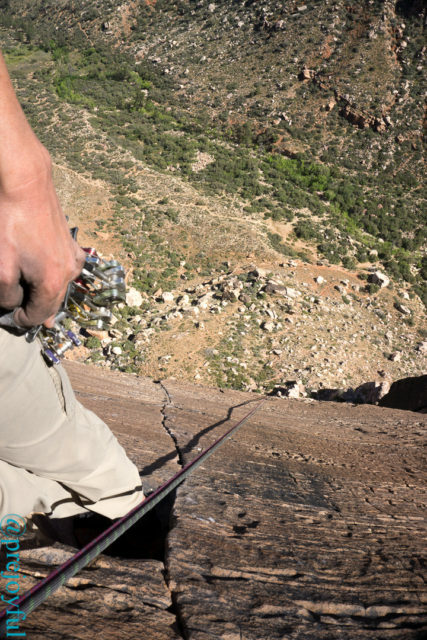 The Creek is amazing – walls extend for miles with splitter crack after splitter crack lining their faces. There’s a lifetime of hard crack climbing here! A return is a must…and since some climbs require as many as 10 #2 BD Camalots, I’ll have to return with friends and many, many cams! After WRF class one day toward the end, we made use of our surroundings and headed down the Colorado River to a local crag, and set up some topropes on easy terrain. School Room Slabs is at Wall Street an easily accessible crag just off Potash Rd. 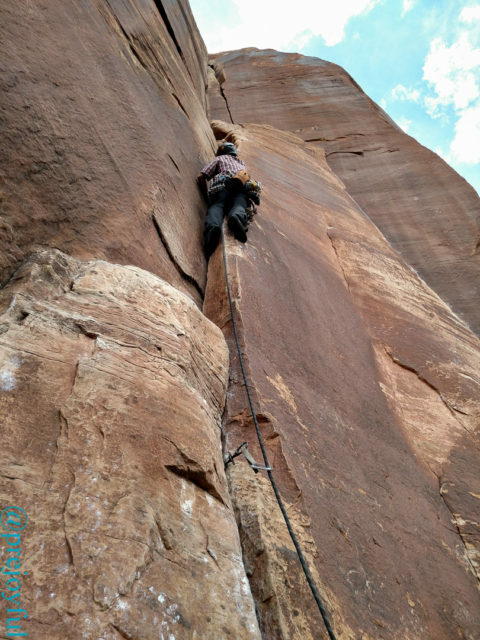 about 20 minutes from Moab, where you can belay from your vehicle off the side of the road! Josh and Sharon were with me again, but we also brought Annie, Mike and Allison (with whom I later ran a 38-mile section of the Zion Traverse). We climbed a few routes before the sun set and we headed back to camp – this was much more relaxed than Indian Creek, but good. Wall Street certainly has some much more demanding climbs as well, if you’re into that sort of thing. Glorious sunset across the Colorado River from Wall Street. 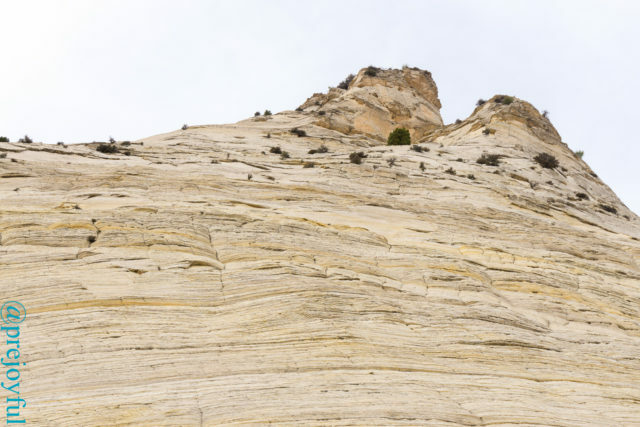 After the WFR class ended, we were hoping to go run up South Sixshooter by the classic South Face route (5.6, 3p, trad). The weather did not cooperate, as seemed to be the norm for my desert climbing hopes. Sharon retreated home to Portland, and Josh and I schemed other options. We looked at weather and thought about drives. Eventually, we decided it was worthwhile to make the 7-hour drive to Red Rock just west of Las Vegas, Nevada. Josh’s girlfriend Amy met Josh in Moab and Annie and I headed off with a rendezvous set up for Las Vegas. Oak Creek Canyon in early light. 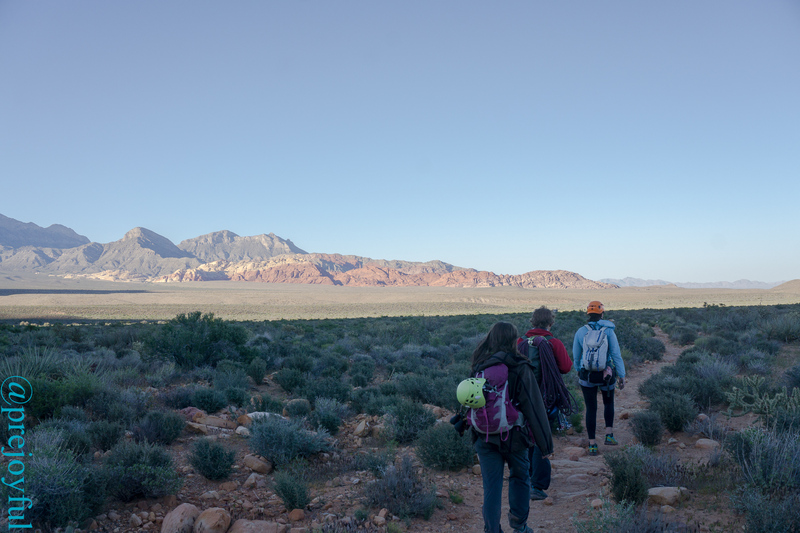 The day after the long drive, we arose early thanking the time shift for an extra, much-needed, hour of sleep, and drove to the entrance gate to Red Rock Canyon National Conservation Area to get an early spot in line before the scenic drive opened. We had in mind the Red Rock classic Johnny Vegas (5.6R 4p, trad). Annie was nervous when we got there, and we decided that I should lead first, so she would have me above, and Josh below in case she felt uneasy. Indeed, she did not love the first (traversing) pitch, though the climbing was good. The holds felt hollow to her, and the big exposure over a traverse really freaked her out. She almost wanted to bail, but decided to give the next pitch a go. Annie traverses on the first pitch. The second pitch had a long runout section with few holds, and I was a bit unsure of my route for a while, but pressed on and eventually got some gear placements. Annie did better on this pitch, with Josh and Amy helping calm her at the belay. Josh loving the first pitch. I took off in the wrong direction on the third pitch, leading into the obvious corner, thinking the protection looked good… this was much harder than 5.6, and eventually, meeting an unprotected 5.9+ traverse, I decided to back off, and down-climbed back to the belay, then took off up the unprotected ridge. The route eventually gained a crack, which I kept following toward the adjacent Solar Slab Gully, though the route was supposed to leave the crack and head up over more unprotected, exposed terrain to anchors I could not see. Eventually, I committed and headed up, and was forced to build an anchor on gear about 30 ft above the intended bolted belay. Josh wound up doing the same thing, and soon we found out that we nearly had skipped the 4th pitch, as I only had 15-20 ft of easy terrain above me to the final bolted anchors. 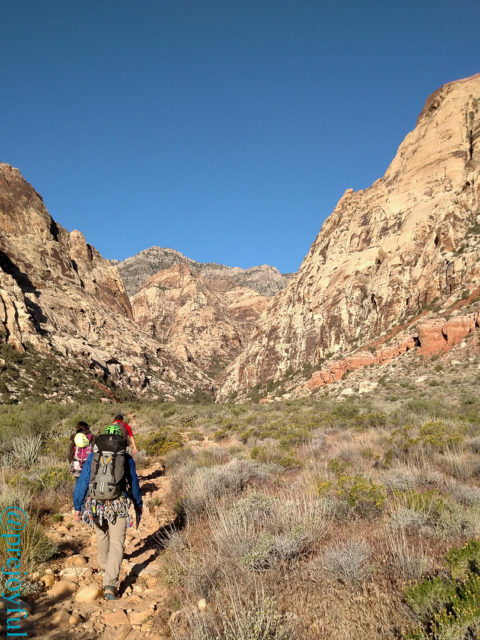 Once we were all reunited at the top of the climb, we looked at the many pitches of Solar Slab above, and marveled at the tall moderate climbing at Red Rock. We lunched and considered options. It was already fairly late in the day, so we started our rappels. With four people, the belays were crowded, and awkward, which slowed us. 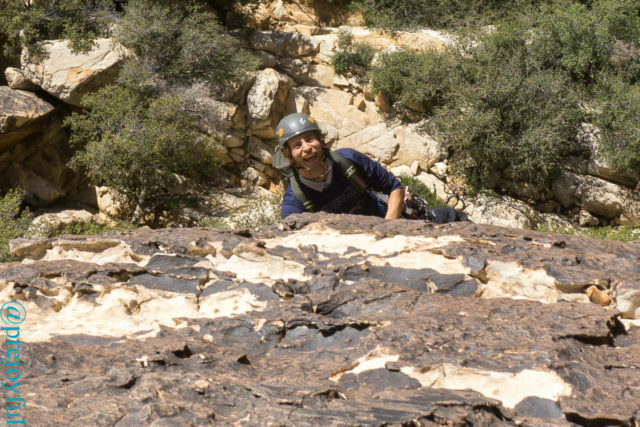 Just before the last rappel, a soloist approached from below. We all froze, not wanting to disturb him in his exposed position. We asked him what he needed from us, and he just said he would climb right around us… soon he was past us, cruising on up the route. If we had been a few minutes faster, we would have thrown our ropes down on him. While this may not have knocked him off, it’s a scary idea! Soloing is terrifying! The climber passed us on our hike out, and told us he normally did this run+climb route in a couple of hours. He is fast! A soloist cruises past us. We decided to end the day after this one climb and try to get a spot at the Red Rock campground. We managed to get one of the handicapped spots, with the understanding that if anyone needed it, we would move. We made Thai Peanut Stew, ate and drank beer, then crashed, exhausted from the long drive the day before and the early rise. Amy comes over the lip toward the second pitch anchors. We rose early again the next morning, though not as early. We got to the parking lot of our intended climb and surveyed climbers heading out – it didn’t sound like any others were heading for Birdland (5.7+, 5p, trad), but when we arrived at the climb, we were behind two other parties, and at least two more arrived as we waited, and another couple as we climbed. The crew is psyched for Birdland! It’s a bit of a hike in, and nothing nearby seemed better, so we decided to wait it out. This is a classic, so it was worth the wait. We used the same system as the previous day, with me leading off first, so Annie would have Josh right behind her, and would not be alone at the belays. 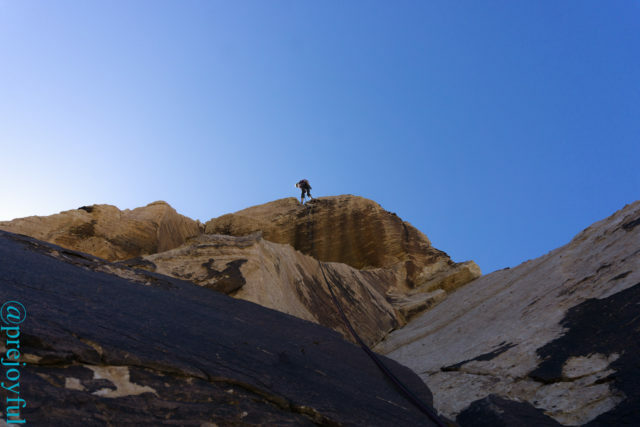 The first pitch was fairly easy and straightforward, while the second leads up through awkward and varied moves through exposed stemming to a large ledge. I thought this was an interesting, but kind of difficult lead for the rating. Annie did not love it. Josh seemed to think it was fine, and Amy did not complain much. 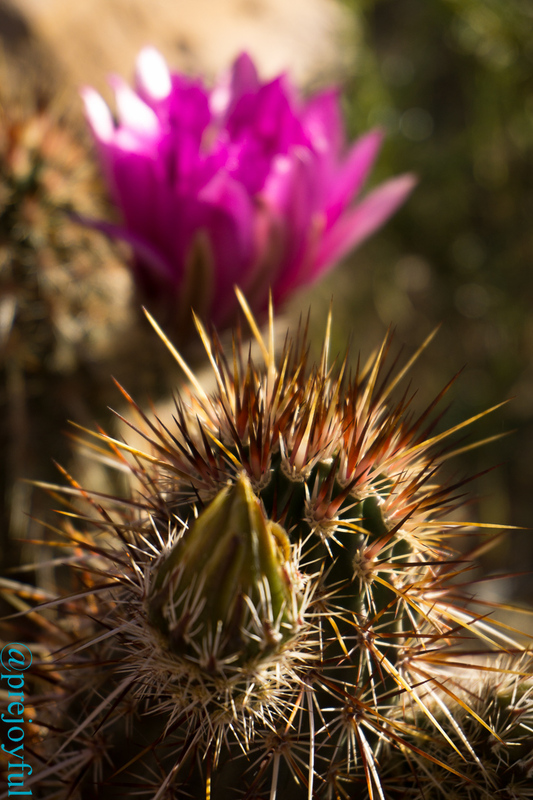 The cacti were in bloom! When I led out on the third pitch, I had a few moments of fear as I traversed on small holds which seemed to flex a bit. 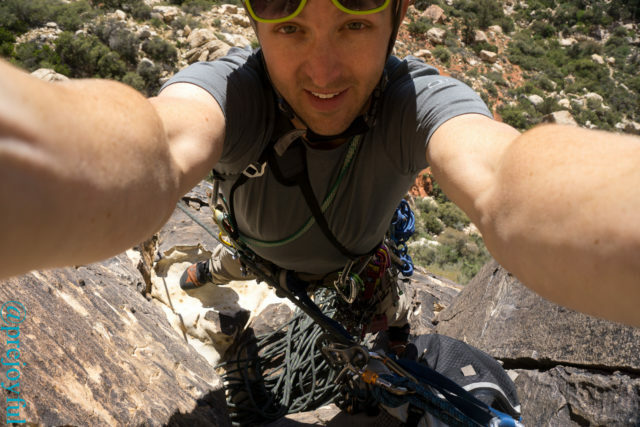 There was one bolt, before pulling up and over a bulge to easier and better-protected climbing. When Annie started up to try this, she was displeased and decided she did not want to do the exposed traversing moves and wanted to retreat to the ground. 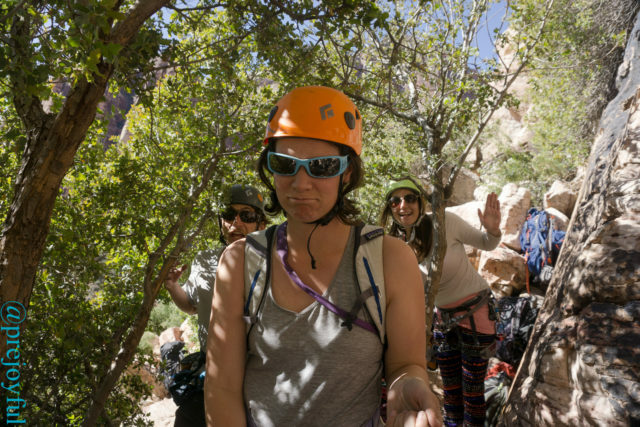 I set up my rappel, and made it 15 ft down when she called up that she would catch a ride back down on another party’s rappel. This meant I could continue to climb with Josh and Amy! Woohoo! Josh quickly led the 4th pitch. We felt the pressure from a guided 3-person party, who seemed annoyed by all the traffic on the route. 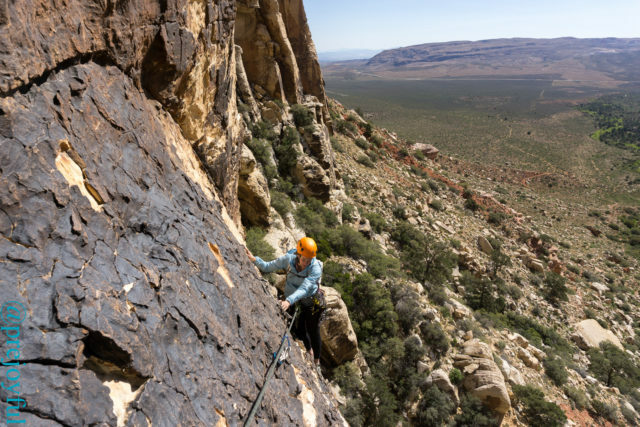 It didn’t help that the rappel route uses the same belay anchors, and more bolts cannot be added because the area is managed as a Wilderness area. Amazingly steep terrain for the grade. I got to lead the 5th pitch, which is mostly easy, but gets quite thin just before the top, and was a little bit exciting just before getting to the final anchor. Three people at this anchor was more than enough, and I could not have been happier to rappel down to a better ledge. When we got to the P4 anchors, I was pretty tired, and had not eaten nearly enough all day. I unclipped from my rappel and sat down on the ledge… not clipped into anything. Not a good mistake! I need to do a better job eating during the day to help prevent this kind of bonk-induced idiocy. Top of P5, looking down at the few tricky finger-crack moves just below the anchors. While rappelling, we got the rope stuck near the anchors of the second pitch. Josh quickly re-led that pitch, freeing the rope, and carefully rappelled back to the P1 ledge while Amy and I watched mice running around the ledge, unafraid of humans. 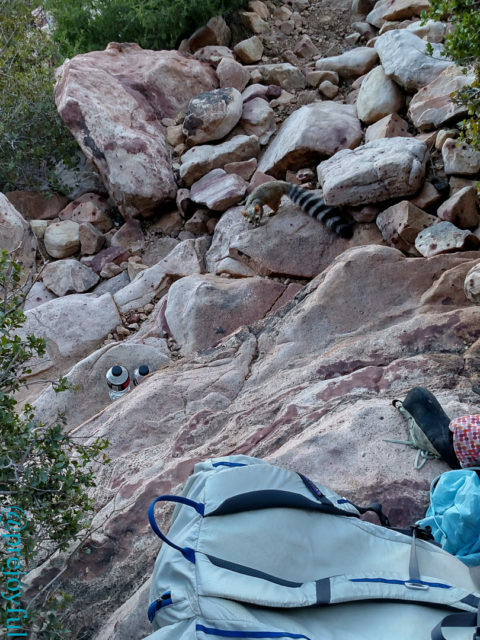 Meanwhile, on the ground, Annie watches a ringtail cat looking through climbers’ packs. When we were all back on the ground, we agreed that the time was ripe for food and milkshakes. Annie’s excellent Yelp skills got us to a place which offered boozy milkshakes, and we indulged before heading to camp on a dried out lake southeast of Las Vegas. It feels weird pulling off the highway onto dirt and just… driving into a flat, dry, nothing. It was a cool spot, though! We discovered (again thanks to Annie’s superior google skills) that we weren’t actually on BLM land, but decided we probably wouldn’t be bothered so far from the road. When we awoke, we found that we were near a huge solar installation, and that there were a couple of RVs parked at the other end of the lake. 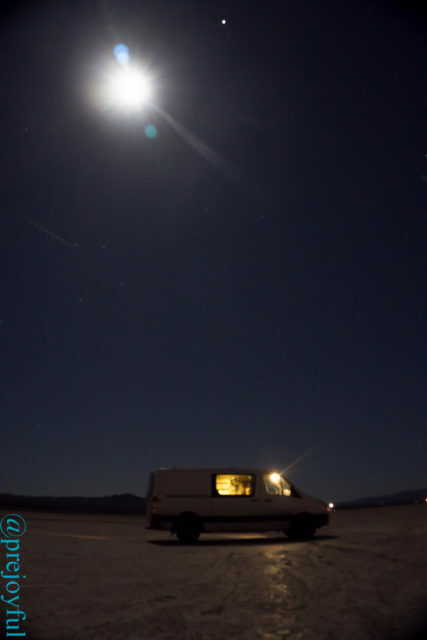 Camped on a dry lake bed! We went to visit the Hoover Dam, made coffee, and walked around for a bit before Josh and Amy had to head out. Amy had work the next day in Colorado. 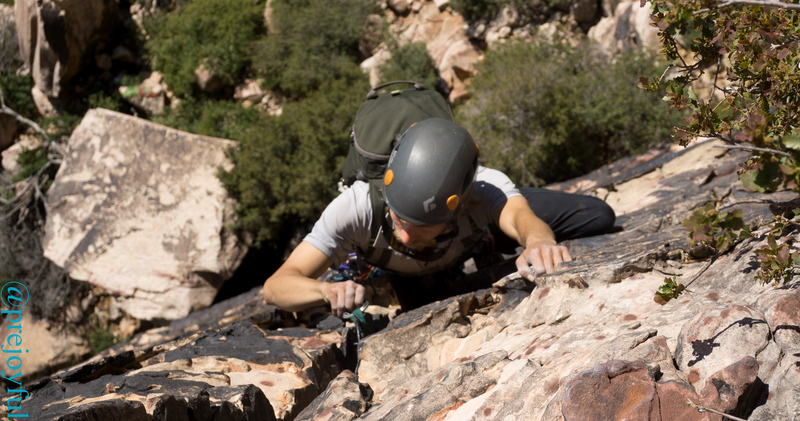 A quick jaunt to Red Rock to avoid wet desert sandstone near Moab turned to a fun climbing trip. I think that next time, if I climb with just Josh, we can cruise much faster, and perhaps climb the full Solar Slab route, or one of the many, many, huge classic moderate routes there. I’ll have to find a full week some late fall or early spring to go climb there for sure! Walking out after a good day on the rock! More pictures from Red Rock! Caleb just recently told me what “prejoyful” meant and I had to look up your website! It’s amazing–so full of life and the pursuit of it. Love it!! Hope you guys are enjoying the rest of summer! Thanks Kim! Hopefully I’ll actually get a post up about climbing in Yosemite soon, so you’ll be featured on the blog! Hah! Hope to catch up with you in NE this fall to cruise some Rumney classics.